I committed sacrilege today. At least, according to my husband Kay, who walked by the kitchen as I was making these cookies, took one look at the dough, and threw up his hands in the air with a horrified look. 'What on earth are you doing?' asks he. 'Erm, making Canada Cornstarch shortbread cookies' says me. 'But, but... the last time I checked those cookies are white, not brown' says he, with a snooty look. 'Ah', says I. 'But these are Canada cornstarch shortbread cookies with a twist. A chocolate orange flavoured twist, to be precise. You'll love them so stop complaining and get back in your cage. Change is good!' says me, with a snooty look of my own. Off he goes, shaking his head, muttering darkly about unruly daughters-in-law that messed about with time honoured grandmotherly and motherly recipes. So why was I messing about with time honoured cornstarch traditions? Well, because Choclette from We Should Cocoa said so :-) The special ingredient for December was orange, and I knew immediately that I was going to tinker with the classic Canada shortbread cookies for this. I added a bit of cocoa and some orange zest, topped it with some spicy crystallised ginger, and voila! A new taste sensation was created. I really enjoyed these cookies. 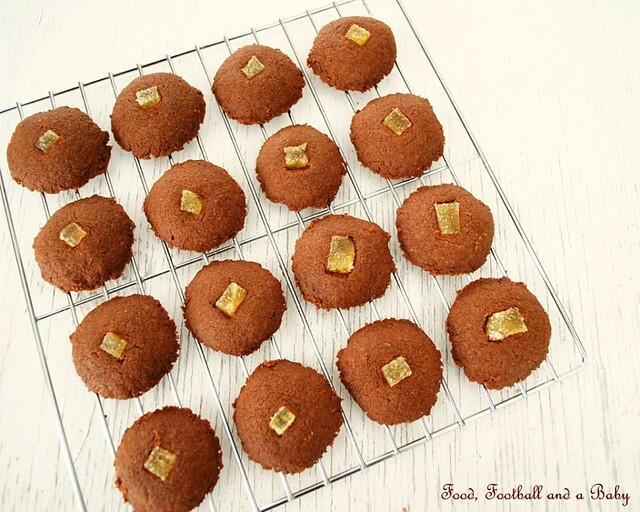 Chocolate and orange are a match made in heaven, and the ginger actually added a different and slightly unexpected element to these cookies. Plus, the house just smelt gorgeously Christmassy when I was baking them. And the texture... well, lets just say that the phrase 'melt in the mouth' was invented to describe it. Aditi loved them, and wanted to be in all the pictures. Now that was a shock, because normally you can never get her to pose for one decent picture. And then realisations struck that she was posing so well, because she was getting a cookie every time I took a good picture, haha. 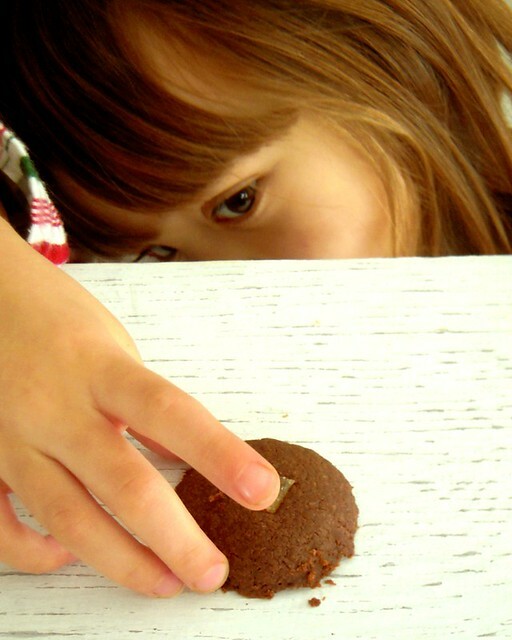 Children are cheeky little manipulative devils sometimes :-) For all his grumblings Kay liked the cookies too. He did say he preferred the plain ones though, but I think I just need to work on him a bit more... change is a good thing sometimes, and my dear stuck-in-his-ways husband needs to catch up! Until then, enjoy these Christmassy little delights. If you are like Kay, then you may want to try the classic Canada Cornstarch shortbread cookies too and I must admit, there is much to say for older traditions. But once in a while its so much fun to mix things up a bit! I'll still be baking the classic versions. I am really loving my Christmas baking this year... I feel like I am honouring old traditions, while adding and creating my own. I love the slightly vintage-y feel of the first picture... and I adore the one below of Aditi trying to steal a cookie while I was photographing them. I had fun taking pictures of them, but I think the light in my kitchen is so cold and blue. The sparkling white snow outside isn't helping either. Any of you photo boffins out there know how I can create some warmer light? Preheat the oven to 150 C or 300 F.
Sift together the flour, icing sugar, cornstarch and cocoa powder. Blend in the softened butter and orange zest into the dry ingredients, until a soft dough is formed. I like to use my fingers for this, but you can also use a wooden spoon or a fork. Chill the dough for about half hour. You don't have to do this, but it helps stiffen it a bit, so you can roll it out easier. Grease your palms with a little butter, then shape the dough into 1 inch balls. Line a cookie sheet with some parchment paper, then gently place the balls on the sheet, leaving 2 - 3 inches between them. If you are not using the crystallised ginger, you can use a greased fork to press down gently on them. 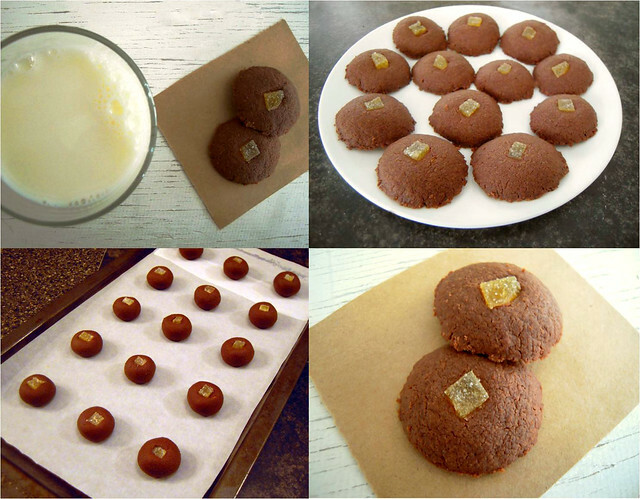 If using, press the crystallised ginger pieces into the middle of the shaped balls. The cookies will be soft coming out of the oven, so let them cool on the baking sheet, before sliding them off very gently. Store in an airtight tin. These cookies can also be frozen. Thaw before eating. These sound (and look) really inviting. Great pictures. I am very happy to take the blame for these ;-) They look gorgeous and that touch of ginger makes them extra warming for this snowy time (for you anyway)! Choclette, as it turns out Aditi's birthday cake was chocolate orange as well... but this recipe worked so well, I had to share it. 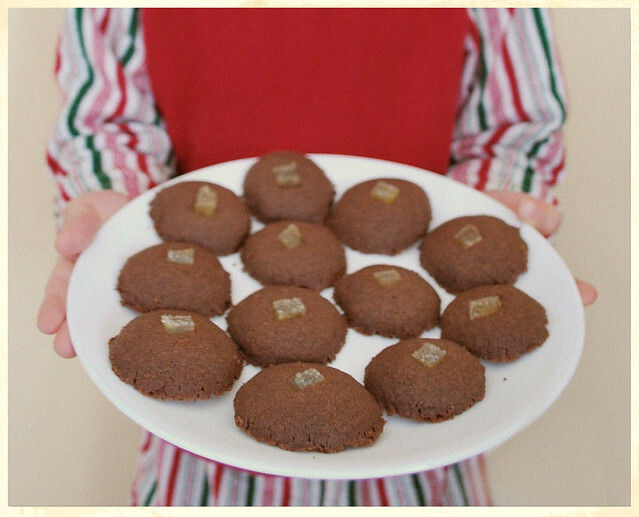 We love crystallised ginger, and I thought it worked brilliantly with the warm flavours. These look delicious. I love that they seem easy enough to do I will have to try them. Dear Michelle, I shall be baking these lovely cookies of yours tomorrow as gifts. I'm excited about tasting them. Thank you so much for sharing. I shall save your site in favourites and get back to you ;).